“A name can be used for more than one snowman.” The six-year-old stomped her foot down in resignation. The pair walked away bidding the newly crafted snowman farewell, the old man crinkling the left over aluminum foil in his pocket. When they were gone, metallic eyes shimmered and glowed. I wrote this for the Sunday Photo Fiction – March 4th 2018 challenge. The idea is to use the image above as the inspiration for crafting a piece of flash fiction no more than 200 words long. My word count is 198. 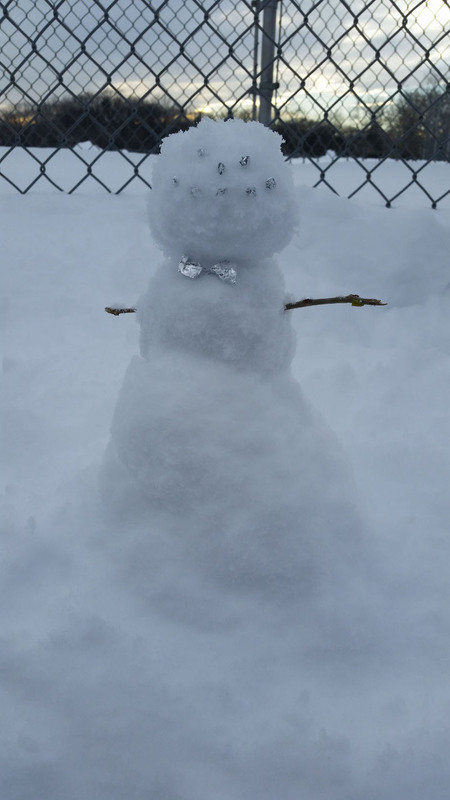 I’ve written a lot of “snowman” and “Grandchildren” stories, but seeing that this snow-being used aluminum foil gave me the idea of glowing eyes. The rest just sort of wrote itself. They’re demons. In Mark 5, Jesus removed about 2,000 demons from a possessed man and allowed them to enter pigs. The pigs then committed suicide by drowning themselves in a sea. I’m not sure one can accurately attribute the notion of suicide to animals like pigs. But one can certainly attribute to them emotions like sheer blinding terror and desperation to escape, sufficient to drive them into a body of water deep enough that they would drown, especially while suffering from severe emotional disturbance that would prevent any natural attempts to swim. Humans also fall prey to becoming irrational when they feel threatened by drowning, and they become unable to help themselves and dangerous even to would-be rescuers. One can thus imagine how an unreasoning animal might feel if its neural pathways were to be invaded by intelligent electromagnetic parasites disrupting normal electrochemical synaptic processes (i.e., one description of the likely mechanism by which demonic “possession” occurs). A pig, in particular, may be just intelligent enough to sense the presence of an alien intelligence entering its brain, though probably not sufficiently intelligent to analyze the event or compare it to any other experience. Many humans may not be that sufficiently intelligent, either — despite the human capacity for abstraction and multi-level analysis of personal experiences supported by their much more highly developed cerebral cortex. Consequently the most likely responses to the discomfort of being thus invaded would be fear and desperation of the degree that I attributed to the pigs in the story you cited. By the way, the “sea” in that story was the Kinneret Lake or “Sea of Galilee” in Israel. And, of course, the human in that story who was the former host of these parasitic demons was also far from rational due to their influence. Modern psychiatry is understandably skeptical or dismissive of the existence of such parasites, even when it recognizes a multiple-personality disorder; and thus its therapeutic model is not really capable of describing procedures to reliably isolate them from the core human personality, communicate with them, eliminate them, nor influence where they might go upon departing a current host. The text of the story is likewise insufficient to support any meaningful inferences about techniques such as Rav Yeshua may have used to accomplish such effects. Given the outrageous behavior recently exhibited by people misusing firearms, perhaps some consideration should be given to developing models of human personality that can account for this sort of parasitic infestation and treat it. Actually, I thought it was the demons who directed the pigs to drown themselves, but then once the pigs died, wouldn’t the demons have been free to possess other people/animals? The text certainly doesn’t offer any clue about the reasoning, if any, of the demons; and it doesn’t say they were responsible for directing the actions of the pigs. It only tells us what happened superficially. The man ended up in control of his own faculties. The pigs rushed into the water and drowned. By the way, I describe it such because I know the topography of the area well enough to rule out any lemming-like dropping over any sort of non-existent cliff. They had to have stampeded desperately down a slope and out into the water across a relatively flat pebble-and-rock beach (not fine smooth sand), scrambling all over each other. But you pose an excellent question trying to envision what possible benefit could demons have derived from such behavior by the pigs. It would have to have been a very temporary one, seeing that the pigs died rather quickly. There may be a clue in the descriptions of demonic possession in Africa and other remote outposts, because animal sensuality seems to figure strongly in all such cases. One may infer that demons seek to experience the sensations that only a physical being can produce. Hence the terror of the pigs could have suited them well, despite its short duration. However, they might not have been expecting such an extreme short-lived reaction from the herd of pigs; and they might not have had much control over the situation. Another unknown is the precise mechanism that enables a demon to interact at all with a physical being. However it occurred that they were able to overshadow the pigs, it would seem obvious that their deaths rendered them useless to the demons, who would then be shut out and remain disembodied until they could find another physical being that was susceptible to their influence and potential infestation. That suggests to me that it may not have been deliberate action by the demons driving the pigs into the water, but that this was merely a consequence of their uncomfortable presence. Reports of “possession” in human history are rare enough that some precise set of conditions must be required to enable infestation to occur. Some religions practice certain meditative techniques to open the human mind to spiritual influences. Certain kinds of immoral and/or sensual behavior seem to increase susceptibility. But I certainly can’t claim any expertise with the subjects of demonology or parapsychology, though the latter seems to provide clues to the electromagnetic artifacts of non-corporeal entities. I’ve merely been exposed to what amount to hints about the nature and characteristics of the unusual phenomena that appear described here and there in Jewish literature. I’ve also observed what appears to me as a certain degree of sensitivity and responsiveness in animals to the human spirit; and occasionally I’ve observed an uncharacteristic temporary change in an animal’s behavior that appears to me the result of a negative spiritual influence. I can’t quantify these observations, and I wouldn’t even be sure about what sorts of parameters to try to measure even if these phenomena could be reproduced in a controlled laboratory environment. But these observations reinforce my confidence that stories such as the Mark 5 report about a demon-possessed man and a crazed herd of pigs have a verifiable basis. Cute and funny, though I’m sure Grandpa and Daria walked away bidding the newly crafted snowman “Farewell” (not “fair well”). I suppose, though, setting the story in Canada, rather than, say, Alaska, offers a fair chance to Amon, Gaap, Zagan, Kasadya, and whoever else might be in there, depending on the precise location. Of course, if that snowman happens to be located somewhere in the Northwest or Yukon territories, temperatures are likely not so different from Alaska — though there could be a significant difference over the several hundred miles between Whitehorse and Inuvik, as on a par between Anchorage and Prudhoe Bay. Nonetheless, melting could still occur even in Inuvik, as average summer temperatures in July can reach 67 F (19 C) and even the lowest average is about 47 F (8.6 C), which should guarantee that even there such a snowman could melt away. Temperatures above freezing seem to begin there in May. Oddly, even if the location were near Calgary, not far from the 49th-parallel border with the USA, the July temperatures are not so different. Montreal is a bit warmer on average. I knew there was something wrong with the way I spelled that. Fixed. I left the location somewhat vague but implied, as you suggest, that it’s a part of Canada that will be cold for quite a while to come. I almost said London since they’ve been having an unusually cold winter this year, but I’m sure they’ll thaw fairly soon. Like you I’m suffering a bit of snow story fatigue. Well done on finding another variation. Mark 5 sounds like a far out there story! Certain parts of the Bible have been mined for titles and fictional themes over the years. This was just one of my takes. Glad it was just you and not the Devil who quoted the scriptures to prove his point. Wonderfully written, James. A delightfully demonic piece James! Ohh, I dunno — It doesn’t seem to me that these bumbling demons are shown to be doing anything that might normally be expected of them as particularly demonic. On the other hand, if we accept C.S.Lewis’ “The Screwtape Letters” as indicating characteristic demonic attitudes and behavior, then bumbling junior-grade demons might not be so unexpected. Of course, in Lewis’ view, such bumblers are likely to become devoured as the first course in a meal prepared by their cannibalistic superiors, or they might just devour one another while waiting for the thaw. Lewis had an interesting sense of how one demon would enrich itself at the expense of a lesser one whose outraged personal sense of self would be overpowered, kicking and screaming while being absorbed into the “bloated spider” of the more devious and dangerous devil’s appetite. Ha ha ha. So much fun. Wonderfully done and funny! Shows that trying to dominate the world isn’t a good idea after all. Not if you can’t tell the difference between a person and a snowman. Thanks.